Please complete the form below and your enquiry will be sent directly to Fat Loss Workshop via email. 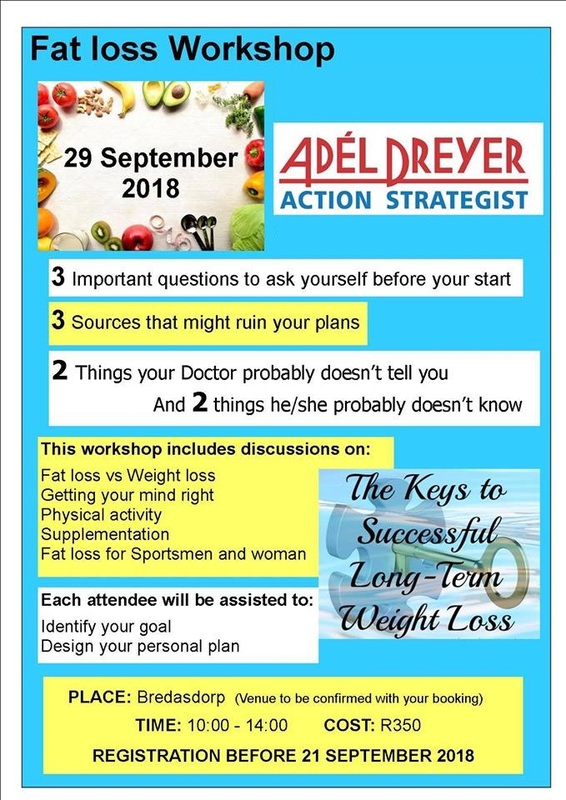 Your enquiry has been sent to Fat Loss Workshop. In this workshop, you will learn quite a few interesting things, facts and myths. You will get coaching to start your Fat Loss journey right and get the necessary tools to be ready for those "down" days and challenges that might occur once you are on your way to a leaner, healthier and stronger you. This workshop is ideal for men and woman and also for moms with kids who are on the verge of being unhealthily overweight. Cost: R350. Registration before 21 September 2018.